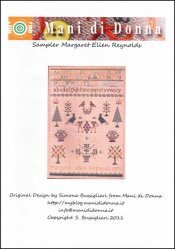 Sampler Margaret Ellen Reynolds [C5722] - $17.00 : Yarn Tree, Your wholesale source for cross stitch supplies. Cross Stitch pattern from Mani di Donna. This design features two men standing in the middle carrying a plant. Around the men are trees, birds & flowers in planters. At the top of the design is the alphabet stitched. At the bottom, "Margaret Ellen Reynolds 1871," is stitched. Stitch count is 164w x 226h.